The US Federal Reserve will meet on the 13-14th of December to decide whether or not to raise interest rates. If they decide to do so, the rate rise, which is highly anticipated, will mark the first and only hike in 2016. The path thereafter is less clear though growing reflationary forces, reinforced by almost certain fiscal expansion under US president-elect Donald Trump, introduces an interesting dilemma. On the face of it a US central bank tasked with maintaining stability of growth and prices would look to tighten monetary policy; indeed, Trump himself has pointed out that setting rates artificially low is wrong. However, if his administration expects to deliver jobs and growth at a faster clip, interest rate hikes may continue to happen in a gradualist fashion. After some very large swings Government bond yields may have established historic lows in 2016. History will determine if the 26-year bull market in bond prices has peaked. Higher yields and steeper yield curves are already on the horizon, but bond yields for now, according to our manager partners, have risen sufficiently in the short term. Those income seekers, for years tormented by low bond yields, will, however be one group welcoming the prospect of rising rates. The Office for National Statistics revealed that in October UK manufacturing output unexpectedly fell by 0.9%, against an expectation of an increase of 0.2%. The dotted line represents expectations of what was expected to happen and the solid line is what actually happened. Total Industrial production (not shown) also fell, hindered by a sharp drop in oil and gas production. If industrial production is at similar levels during November and December it is expected that UK GDP growth will slow to 0.2% for the final quarter of 2016, compared to the 0.5% slowdown which took place in the previous quarter. However, recovery in oil prices which has taken place and a pick-up in final demand would help produce a better growth outcome in future months. On Sunday, in a rerun of the country’s presidential elections, the far-right candidate of the Freedom Party of Austria, Norbert Hofer, conceded defeat to the independent candidate Alexander van der Bellen, the left-leaning, pro-Europe moderate. The vote was seen as a way to gauge anti-establishment sentiment in Europe following the Brexit vote and the election of Donald Trump in the United States. Mr Hofer had previously suggested that Austria hold a referendum on whether to remain part of the European Union and his defeat was welcomed by mainstream political leaders across Europe. With the whole Brexit debate playing out in scaremongering fashion in the media, and with a series of referenda, elections and bank bailout concerns coming up across Europe we recently asked our fund manager partners for their views on European equities. They can detect value, but they also express concerns about the political landscape and how this might lead to even scarier headlines. It seems there is a marked difference between the micro (stocks) and the macro (economics) landscapes. 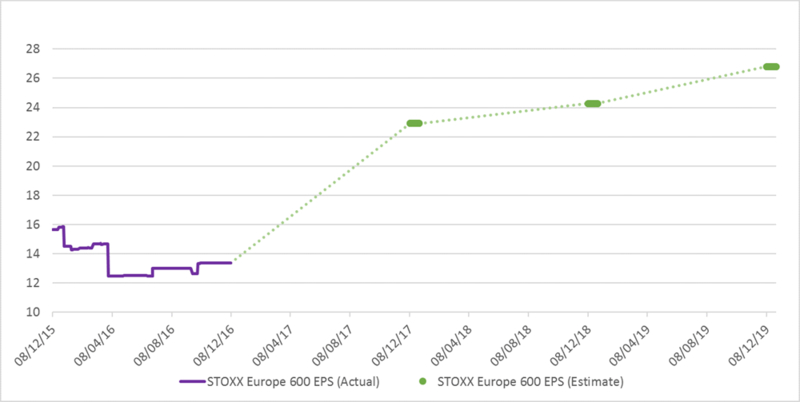 This is borne out in the chart below where we show the expectations component for profits of European companies. The consensus of analysts’ bottom-up forecasts depicts a remarkably resilient and positive outlook for profits. From the graph, we can see that aggregate corporate profits are expected to stage a large rebound next year, forecast to rise by 71%. 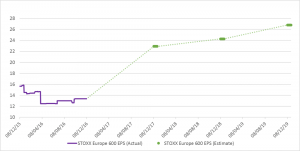 This estimate is based on the Euro Stoxx 600 Index series, with cyclical sectors like those in the Automotive and Chemical industries forecast to contribute the most. Through conversations with our fund manager partners, the general consensus is there are many multinational companies in Europe on depressed valuations (by historic standards) weighed down by political risks. While debate around the EU, the Euro and weak European banks is likely to intensify next year, it seems there are many other European companies with a strong profits outlook.